The English Health service is run by the UK Government. 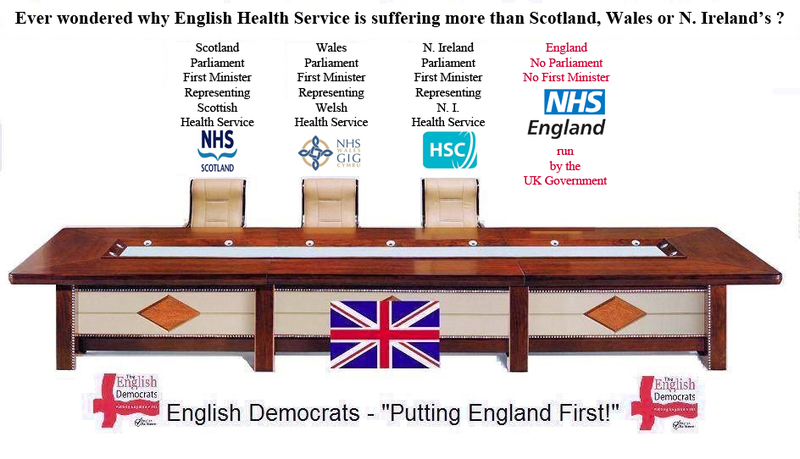 Scottish, Welsh and N. Ireland Health services are run by their respective parliaments, this is why we have the least amount spent per person on English Health care and why NHS England is failing. We need an English Parliament, with an English First Minister with accountable English MPs to run English public services. No matter where you live in the UK, you will find local NHS services are under immense pressure. None of the four nations is achieving any of its three key targets for A&E, cancer or routine treatments, such as knee and hip replacements. All have developed plans and strategies to deal with the common challenges – rising demand, squeezes on funding and the ageing population. But each has found this winter to be particularly difficult. 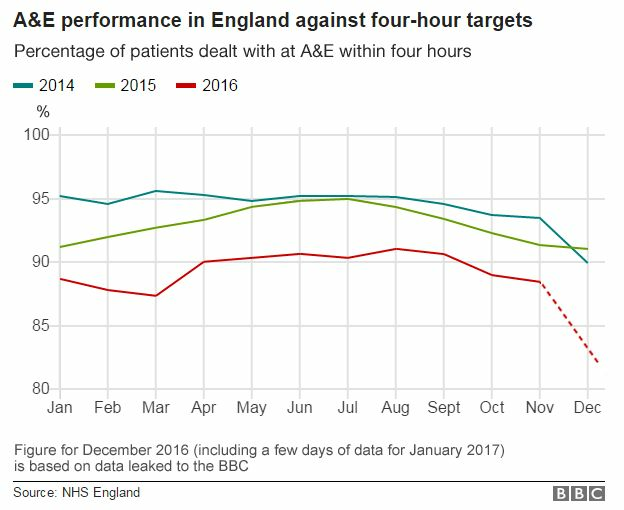 Key fact: Just one hospital trust hit the four-hour A&E target in the first week of January. The system: The NHS is split between providers of services, known as NHS trusts, and commissioners, working for clinical commissioning groups. Social care, covering care homes and help in the home, is organised by councils and is means-tested. The story so far: The first week of January was the most difficult since the four-hour target was introduced in 2014. The proportion of patients being treated or discharged in time fell below 78%, withnearly half of hospitals declaring major alerts because of a shortage of beds. An estimated one in five patients ended up facing long delays for a bed after an emergency admission – double the normal rate – while ambulance crews reported problems handing over patients to A&E staff. It comes after a gradual increase in pressures in recent years. The winters have been getting progressively worst, while the 62-day target for cancer treatment to begin following an urgent GP referral has been missed for 11 months in a row. The number of people on hospital waiting lists for a routine operation has also been rising. NHS bosses set out a five-year vision for the NHS, which involved a greater emphasis on keeping people well in the community. But savings also have to be made – there is a £22bn target for 2020. This has led to the development of 44 local plans to overhaul services – some of which involve closing hospitals and cutting staff. Key fact: 63% of A&E patients were seen in four hours over the Christmas period. The system: There are five integrated health and care boards that run hospitals, community services and social care. The over-75s get free care in their own home if they have high needs. 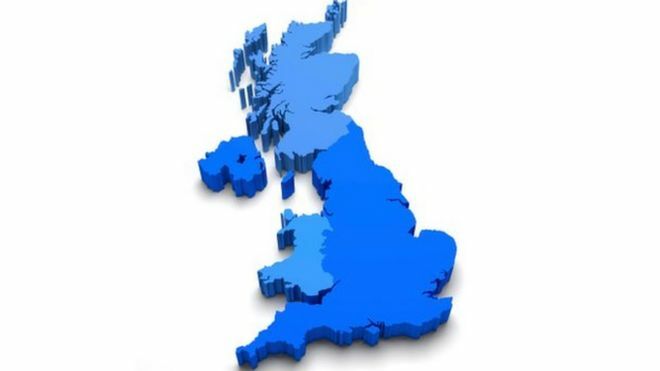 The story so far: Northern Ireland has some of the worst performance figures in the UK. During the Christmas period, the number of patients seen in four hours in A&E departments dropped to 63%. Exactly the same proportion started their cancer treatment within 62 days, according to the latest statistics, while the numbers waiting longer than they should for a routine operation have almost doubled in the past four years. In response to the growing pressures, ministers have already set out a new vision for the health service, which they acknowledged was at “breaking point”. A 10-year plan was published in the autumn, which called for greater investment in general practice as a way of coping with the rising demands on hospitals. The plan was widely criticised for its lack of detail and costings. It did not mention hospital closures, but there is a general consensus that Northern Ireland has too many small units and care would be better concentrated in fewer bigger centres. Political instability in Northern Ireland, which is facing its second assembly election in less than a year, also means the budget for the next financial year has yet to be agreed. Key fact: Scotland was the last nation to hits its A&E target – in July. The system: The NHS is run by 14 health boards that organise hospital and community services. Social care is organised by councils with personal care – that is help with washing and dressing – provided free in people’s homes and residential care if an individual has high needs. The story so far: Out of all the four nations, hospitals in Scotland seem to have fared the best. Weekly data shows four-hour performance in major units hovering around the 90% mark during January. Much of the credit has been given to the way councils and the health service are working together. Budgets have been pooled, encouraging a close working relationship to help get frail patients out of hospital by providing extra rehabilitation services in the community. But most of the progress has been concentrated in and around Glasgow and Edinburgh, where over a quarter of the population lives. Arguably, this gives Scotland an advantage, as improvements in just two regions can have a significant impact on performance. In terms of cancer treatment, over 87% started treatment within 62 days, according to the latest figures, below the 95% target. Key fact: 81% of patients were seen in four hours in A&E during December. The system: The NHS is run by seven health boards that organise hospital and community services. 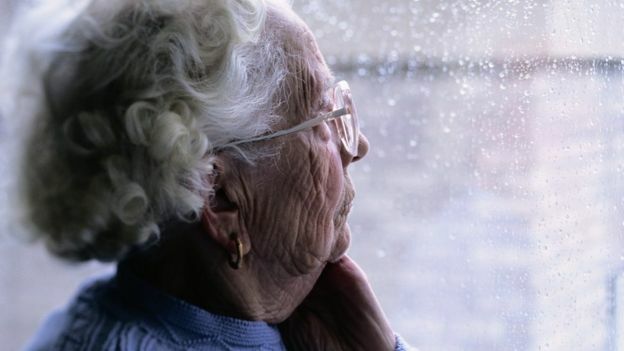 Social care is organised by councils, which cap the cost of home care at £60 a week. The story so far: NHS Wales boss Dr Andrew Goodall has described the pressures seen this winter as “exceptional”. Some hospitals have been reporting a 10% rise in admissions compared with 12 months previously, while the ambulance services said the start of the year had been the busiest on record. The government invested an extra £50m to help hospitals deal with winter pressures and this paid for an extra 400 beds – the equivalent of one more district general hospital. But the numbers being seen in four hours during December dropped to 81% – well below the 95% target. And the numbers waiting over 12 hours nearly hit 2,500 – a rise of two-thirds on the same period the year before. Wales has become the first part of the UK to redefine how it deals with 999 calls. 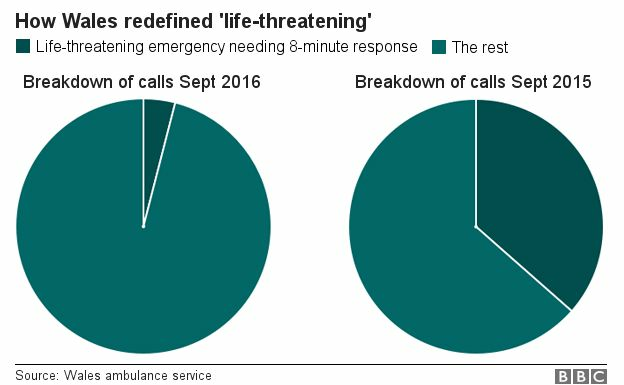 Instead of requiring ambulances to reach a third of calls in eight minutes, it narrowed the number of conditions needing an urgent response and now just aims for this in abut 5% of cases. Ambulance bosses say this has allowed the service to use its fleet more effectively, which means the most life-threatening cases are getting quicker treatment. Over 86% of patients given an urgent GP referral get cancer treatment within 62-days – some way short of the 95% target.